“Big Momma’s House” makes a severe error in judgment by assuming that, when slim men dress in drag in comedies, playing overweight women in their twilight years is the compulsory approach. This plunge has already seen more than its fair share of interpretations in the cinema, and as such, has become a tired and clichéd instrument of movie making. The idea was most recently milked to death by comedies such as “Mrs. Doubtfire” and “The Nutty Professor,” but those films, at least, are ambitious in certain ways. The filmmakers behind “Big Momma’s House” seem to only have one desire in mind: to trap an actor in an oversized body suit, have him wander around and, ever so often, shout out insipid dialogue to see if moviegoers’ interest will last long in the less-than-amusing transformation. But the movie beats a dead horse in more ways than one. Aside from being undermined by a limp and dreary formula, “Big Momma’s House” also fails to realize that its star, Martin Lawrence, has been successfully seen in drag already (his admirers will recall the “Shenanay” persona from his Fox sitcom “Martin”). One essential factor in these movies is to be startled by the unlikely transformations, but thanks to Lawrence’s experience in the field (not to mention the overblown media exposure of the complex metamorphosis), the film lacks its ambush. Furthermore, the overall execution is neither funny nor stimulating. Lawrence plays Malcolm Turner, an FBI agent on the hunt of an escape convict known infamously for bank robberies and homicide. One of the convict’s potential contacts is his ex-girlfriend, the beautiful Sherry, and Malcolm and his partner are sent to keep an eye on the house of her grandmother, Hallie (also known as Big Momma), hoping that the endangered young woman will show up. But Big Momma goes on a trip and Sherry calls up to tell her that she’s on her way to the house. The solution: since Malcolm has experience with makeup, he decides to dive into the pool of risks and assume the role of the girl’s larger-than-life grandmother. The consistent problem with most setups of this nature is that they require their characters to be easily fooled by an evident disguise, and “Big Momma’s House” is no exception. The thickness of Sherry’s relationship with her grandmother is evident, and yet she is never once convinced that Big Momma looks or acts differently than before. 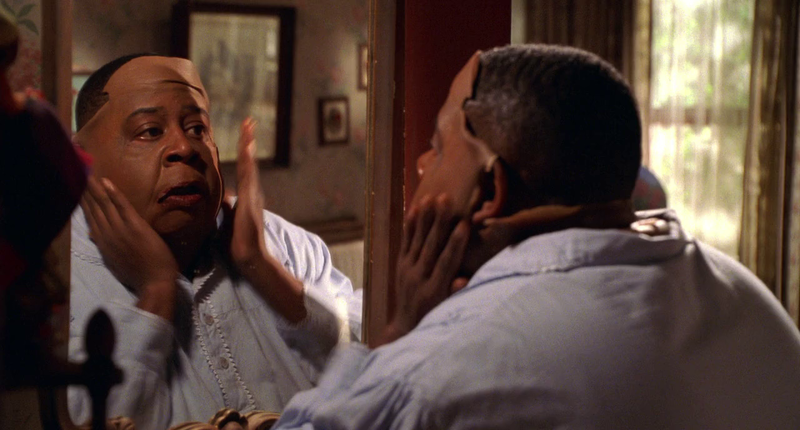 Lawrence can indeed pass off as an old woman, but he shares little similarity to the authentic Big Momma played by Ella Mitchell, leaving many to question the intelligence of the grandmother’s neighbors and family members. It’s almost like seeing someone get cosmetic surgery and no one in the family or neighborhood is bright, or observant, enough to notice the changes. The comic tones are no more pleasant; in fact, when the laughs are not stupid, they are simply grotesque and reprehensible. I am not trying to discredit bad taste in general, because, lets face it, comedies like “There’s Something About Mary” and “American Pie” are skillful enough to make big laughs out of gross scenarios. In “Big Momma’s House,” however, the tastelessness is so intense that we are left staring in utter displeasure. At one point, Big Momma even suffers from diarrhea, allowing the director to get all sorts of nasty sounds and sights out of the experience in a bathroom. Funny? More like sickening. Martin Lawrence doesn’t seem to function well as an actor unless he is in disguise (even his snaggle-toothed second persona in “Blue Streak” was amusing), but the task of pulling of the Big Momma masquerade is obviously too much for him to handle. He never once looks comfortable in the role—only the scenes when he is outside the makeup and the latex is he okay. A note to filmmakers: take this as evidence that, if you’re going to have a person play an overweight woman, make sure the actor fits the physique. While you’re at it, throw some decent and intelligent comedy into the mix instead of scenes in which Big Momma has bathroom problems.